If you have any questions, please email us at support@partnershipprofiles.com. 2018 Minority Interest Discount Database/Executive Summary Report on Re-Sale Discounts - Subscribe now and receive instant online access to the Minority Interest Discount Database. This online database can be queried from your desktop to identify detailed real estate limited partnership and REIT data on more than 400 publicly held real estate programs. The 2018 edition includes 5 new real estate programs and updated price and historical financial data on actively traded real estate limited partnership and REIT interests. Click Here to see how this information can be used. When ordering a 12 month subscription to the online database, you will also receive the 2018 Executive Summary Report on Re-Sale Discounts and Detailed Program Data by mail. The Executive Summary Report and Detailed Program Data are sent via USPS or overnight delivery. (This report is not sent electronically.) This product provides access to all available data and is designed for appraisers to determine discounts for the valuation of noncontrolling interests in real estate entities such as Family Limited Partnerships (FLPs) for tax related appraisals. Buy Online Now for $495 for fastest processing or print off and complete an Order Form that can be mailed or faxed by Clicking Here. If you'd like to take advantage of a volume discount for multiple users, please Click Here. The book includes all of PPI's annual Partnership Re-Sale Discount Studies published between 2012-2016. This is a comprehensive update and many of the changes are based on the authors' experience handling IRS audits regarding discounts for lack of control and marketability. For more information, see the Table of Contents. You can order the 5th Edition for $169. This data was the basis for BVR's recent webinar, "Using the Empirical Method for Determining DLOMs" and has been presented at the AICPA, NACVA and ASA Business Valuation conferences. The report will be emailed in a PDF document upon purchase and includes an example to demonstrate how to apply the study. Buy Online Now for $149. 2019 Rate of Return Study - Newly Updated - The Rate of Return Report is one of the most popular reports. This 16 page study provides detailed information about historical rates of return for real estate entities such as publicly-held limited partnerships and REITs. The report not only provides the detailed information, it also explains the basis for the calculations. The information provided in this report is useful when calculating a discount rate using the Income Approach to value FLPs that hold real estate. The rates of return for limited partnerships and nonlisted REITs include expected returns for distributing, non-distributing, high debt and no debt partnerships. The calculation of the real estate risk premium using the most current data is also included. Get the most recent rate of return data by ordering today and the report will be emailed in PDF format to you for only $149. 2019 Partnership Guideline Reports - Newly Updated - Do you need lack of control discount data and a thorough narrative at your fingertips to support the value of a minority interest in a real estate FLP, LLC or other entity? The Partnership Profiles' Guideline Reports were created for just that purpose and will save valuable research time. They provide a professionally written description and market tables illustrating historical pricing multiples. For a description of each report, see (List of Reports). Purchase a report online today and it will be emailed in PDF format today that identifies, analyzes and discusses seven or more partnerships that best represent a specific market segment. Click here to see a SAMPLE excerpt from a report. Each report provides a description of each partnership, lists market pricing multiples (e.g. Price to NAV ratio) and includes a detailed financial summary for each partnership. Now you can have detailed guideline entity information to support your appraisal conclusions in a matter of minutes. Buy a Partnership Report for only $175 per report. - Report #3 - Non-Income-Producing Real Estate Partnerships was last updated in 2017 because data on undeveloped programs is no longer available; please consider Report #4 to obtain new market data when valuing a noncontrolling interest that does not pay distributions. - The oil and gas partnerships in Report #5 have liquidated but the ramainer of the report has been updated with current Oil and Gas Industry Data for 2018. Closed-End Fund Guideline Reports - Price to NAV ratios are updated as of March 31, 2019 - The Tax Court and the IRS have stated that comparisons using closed-end mutual funds are particularly persuasive for the valuation of FLP's that own marketable securities. The Stock Closed-End Fund Report covers 40 equity funds that own domestic, international, and real estate securities. The Fixed Income Closed-End Fund Report covers 38 bond funds that own government, corporate and municipal fixed income investments. Order a Guideline Report that provides detailed information about closed-end funds. Click here to see a SAMPLE description from a report. These reports can be used to quantify the discount for lack of control (DLOC). Each 40 + page report will be emailed in PDF format instantly and includes a detailed description of each fund, its distribution policy and investment objective. The annual and monthly Price to NAV ratios (1 - DLOC) for each fund are also included for each of the past 5 years. The Price to NAV Ratios in each report are updated within the first week of every month. The summaries within the reports are updated annually at the end of April after each Closed-End Fund releases its 10K Annual Report. These reports have so much information, they can be used for several appraisals. Save research time and provide empirical evidence to support your appraisal. Buy a Closed-End Fund Guideline Report for $150 per report. 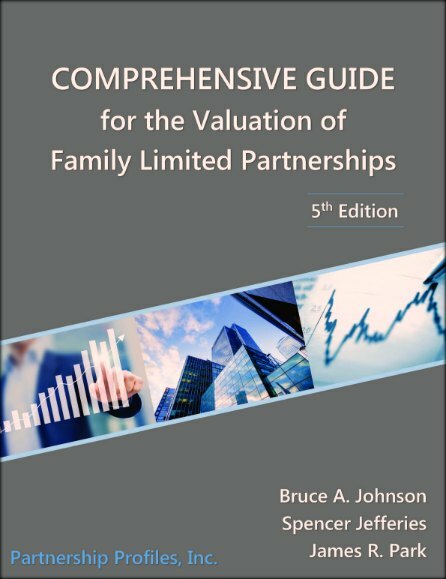 Sample Appraisal Reports - Invaluable for Report Writing - For many years, Partnership Profiles has offered data and research for the valuation of family limited partnerships. We have been asked numerous times to provide Sample Appraisal Reports that demonstrate how to use the data and explain the methodology in a report format. So, we are pleased to offer four different Sample Appraisal Reports for sale - Report #11 Income Producing Real Estate, Report #12 Marketable Securities, Report #13 Mixed Assets and Report #14 Nonincome Producing Real Estate. For information about each report, see FLP Sample Appraisal Reports . Get a jump start on writing your report by using these samples as a template or improve your existing reports. Buy a Sample Appraisal Report. All Sample Reports are sent via US Mail. If you would like the shipment expedited, please choose the Fedex option during check out. To subscribe to the Direct Investments Spectrum Newsletter (formerly the Partnership Spectrum), please call 1-800-634-4614.